“A riveting thriller packed with a lot of action” (Larry Bond). If you like Baldacci, Thor, or Flynn, you’ll love Arctic Wargame. 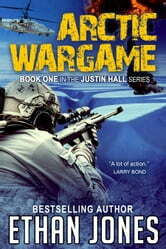 Arctic Wargame is the first book in the Justin Hall Spy Thriller series and has just been reissued. This was the first book by Ethan Jones that I had read, so I wasn't sure what to expect. What I found was a well crafted thriller. This book is the start of the series but is a standalone book. The last couple of chapters hint that there is more to the story and it isn't over quite yet. but the book does not end in a traditional cliffhanger. There is violence. The book blurb adequately describes the storyline so I'm not going to repeat that info here. The author did a good job of keeping a steady pace throughout the book to keep this reader interested. It kept you guessing what twists and turns would be revealed in the pages ahead. After all, why would Denmark be trying to invade Canada? As usual, nothing is quite as it seems on the surface. I really enjoyed this book and had a hard time putting it down. I intend to keep on reading more about Justin Hall. If you like books from authors like Brad Thor and Vince Flynn, you will enjoy this series as well. I was provided a copy of this book and really enjoyed it. I found it to be action packed just like a movie. In fact, it would make a good movie or good intriguing tv show. I found it suspenseful, thrilling and well written.I would read more books by the author. Justin always seems to find trouble wherever he goes, but he somehow manages to survive, as heroes should. This time he is in the Arctic. It's freezing, there's lots of snow and ice causing challenges. I don't want to give too much away. I have read several books in the Justin Hall series, not in order, haha. They are all stand-alone books, so they don't leave you hanging or force you to buy the next book in the series to find out what happens. I love that. This is the first book in the series. Couldn't put the darn book down! Great to have the Russian FSB as the bad guys again and both unusual and refreshing to have Canadians as the heroes. Added enjoyment having the saga play out in the Arctic Circle, so that Justin and Carrie have to battle it as well as the protagonists. A slightly far-fetched premise, but the storyline was intriguing and contained plenty of action, and some well developed, engaging characters, especially a couple of rather eclectic inhabitants of the frozen north. A great action-packed read and a terrific introduction to both the characters and the author, whose every book I have now read and I'm patiently awaiting the next adventure! I loved this book. It is a revamp of Ethan's first book and this revamp is riveting. Sent on a “do or die mission” to redeem themselves, Justin Hall and his partner Carrie end up in the frigid Arctic. They don’t know there is a traitor in their midst until it is too late. Left stranded in the Arctic with no weapons or food it looks like the end for them. Who is behind this traitorous plot? Does it have anything to do with the icebreakers that appeared off the Arctic coast? Can they stop this or will they die trying? Don’t miss this revamped and chilling Ethan Jones thriller.